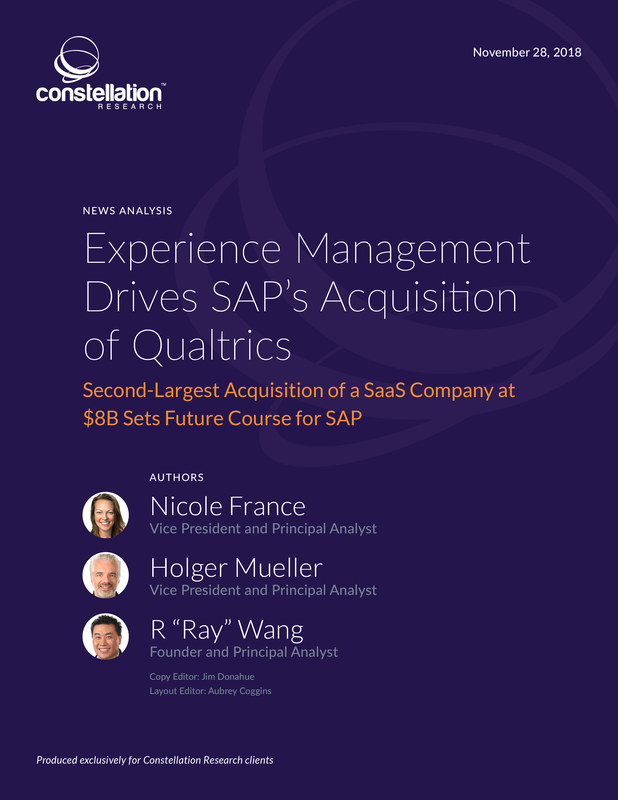 Experience Management Drives SAP’s Acquisition of Qualtrics | Constellation Research Inc.
On November 11, 2018, SAP announced it would acquire Qualtrics, giving SAP new capabilities in customer, product, brand and employee experience measurement. This acquisition signals SAP’s investment into a new category of software called experience management (XM). The Qualtrics team will mostly remain intact with the CEO and founders reporting to Rob Enslin, the SAP board member in charge of the cloud business unit. Constellation sees this acquisition as a natural consolidation in the XM feature market because the independent vendors will align with the larger cloud suites and platforms. To this point, enterprises have been on their own in figuring out how to connect their data streams from traditional enterprise software vendors on one side and survey/experience vendors on the other. Customers have had to integrate data streams on a manual, ad hoc and project basis, and the process has been painful. But now, the shift from engagement systems to experience systems has begun.